Arngrim: "Since an adult would find it fun to be famous, they assume that a child would feel the same way." 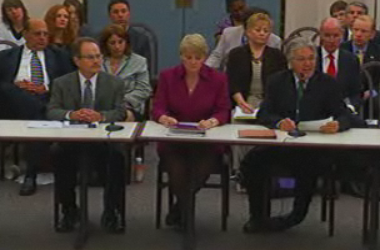 Adults can provide informed consent, Paul Petersen says. Children cannot. "The loss of privacy, separation from peers, the potential for humiliation and damage of character." Jon Provost: Animals on TV have better protection than children. Alison Arngrim: "I believe my successful outcome was not a matter of luck but certain structures being in place. "Parents don't realize when they sign up that this can be a permanent "sentence." "We played characters that were not ourselves. If we were judged by strangers we had the option to say that's not me that's my character." Paul Petersen says of all the former child stars he has met in his lifetime, only six have ever allowed their own children to become child actors as well. "Absolutely not," is the answer he hears from most former stars, he says. Jon Provost, Alison Arngrim, Paul Petersen. at the age of 18 the Gosselin children can go to court for Redress (Remedy or set right )...because their 'contract' was not overseen by the Supreme Court decision. TLC has made 200 Million off the backs of those little kiddos. Paul P. was pretty pointed on this fact. Good grief. I was taking a look at one of the sheeple blogs regarding the hearing...just out of curiosity in regards to how they view the new bill. Some of them really are out of the loop, aren't they? In the intro to comments, the writer of one blog questions why child actors of past years are testifying and doesn't understand how that relates to reality television because the shows in which they appeared were scripted. Tell me sheeple really aren't that clueless. They can't figure out that 1. Reality television IS scripted. These kids are told what to do, what to say, and where to go. 2.These former child actors suffered from the same loss of privacy and exploitation that kids on reality television experience. Who knows best to testify than adults who lived this and who have been through it? It doesn't matter if it's a scripted television show or a reality show. The fact is that the kids today on reality shows DO NOT have to give consent. It was the same twenty years ago with scripted shows as it is today on reality shows. I officially LOVE Alison Arngrim. Humorous, enlightening. Very much an advocate and common sense. I wonder if Kate would ever even consider that perhaps, just perhaps, that all these folks with so much more experience than she, could be right and she could be wrong??? I think not. These people seem honestly sincere in their concerns for her children and all children whose parents think this is all OK. It is NOT. Here's hoping protection for all children is accomplished by their efforts. Thank you so much for the link - I didn't expect to get to see the hearing and was so impressed with the testimony of Paul, Alison and Jon. If this doesn't convince the legislators, nothing will. As they closed the session the chairman said that they are at the end of a legislative session so would not be taking up the bill until they convene next session - does anyone know how long that will be? I'd love to see something passed ASAP (as we all would) to make life better for the Gosselin 8. The only other thing that I wish someone had said when they were discussing the 15% rule - nobody that I heard ever pointed out that each of these kids, because there are 8, will receive less than 2%. I'm not saying each should get 15% because it's mathematically impossible, but I do think that special provision should be made for these reality tv families with super multiples. Discussing taxes and background checks. Good points brought up so far. Also, one man questioned the parents that put their children on reality tv and then are in charge of their funds. Also brought up the set teacher being responsible for the child's welfare. SAG does NOT cover ANY reality tv shows/actors, etc. They are also debating whether reality shows are "scripted." Currently all reality shows are non-union/SAG. They brought up the "Christmas" episode and everyone agreed if it was not filmed on Christmas it was scripted. Now they are discussing the 15% (it's 15% of the Gross). Child is paid 15% of gross. Taxes are paid on gross (withheld). Then there are agent/manager fees (if they have one). 15% goes to a trust. The child should get a check for the remainder less any taxes, fees and parental expenses. Also, regarding taxes, VERY interesting... Children have NO deductions when they are taxed. They can't own property, etc so they get a lot less money net after taxes. There's a "producer" speaking who is more concerned about how the permits and trust funds affect production companies that do commercials. Okay, I get that there's a difference but maybe there should be an exemption to a 30 second or 1 minute commercial as opposed to a larger production such as a tv series. Excellent testimonies, discussions, and questions from the committee. I think this was a very positive thing for ALL kids in Reality TV. Kudos to Alison, Paul and Jon P for their statements. This is a REAL issue that all states will likely have to contend with considering the rush of reality tv programs currently. Now if something could be done about the immoral behavior on the MTV shows! Caught the finaly 10 minutes of the hearings. Sounds like nothing will be up for vote in the General Assembly until after early January when the new session convenes. If TLC works really fast, betcha they will try filming the kids for several more specials when they are out of school for holiday breaks. "The General Assembly meets at noon on the first Tuesday of January and then regularly throughout the year. Both houses adjourn on November 30 in even numbered years when the terms of all members of the House and half the members of the Senate expire." I applaud Paul Petersen for his heartfelt concern and hard work for the cause of his peers! He carries himself with such class and dignity. He is well informed, and presents himself well. I can think of no one who could do the much needed task as well as him! With that being said, I PRAY that something is done soon to protect the G-8! Their mother is sick, and getting sicker. All the "I told you so's" in the world that we are all throwing out there will mean nothing when this kids are suffering the inevitable. It pains me now to watch them, so I do not. I can barely stand to see them in still photographs. I come from a large family. My parents were young and truly, truly did the very best they could, however, we WERE labeled by others who did not always remember all of our names- the pretty one- the smart one- the athletic one- the shy one- and on and on. We were given tooth brushes in chosen colors to eliminate confusion and fighting, etc. I not only would NOT have wanted people to "hear about things" at the time my parents were trying to raise us- there is NO WAY that I would have wanted someone to film some of the chaos that was our life- to be viewed over and over again by strangers to both enjoy- and judge, even though I think that my parents worked hard to do a GOOD job! They were selfless, and sacrificed everything to raise us well. No one ever gave them a thing! They both worked hard for everything- and all of us grew up to love and appreciate them beyond words! That being said- the eight do NOT behave age appropriately given the circumstances they are exposed to- HOW COULD THEY?? With ADULT people in and out of their lives on a regular basis (including their own mother) who could?? It makes me sad, very sad. They should be happy and joyful- especially with all the EXTRA trips and stuff- but that just proves that money does not buy happiness. Our next memories growing up are the simple things. My mother's smile being one of them! I hope that Jon was watching this... was he aware that TLC made 200 million off the backs of his kids? I hope that this fact will be brought up if Kate EVER was to cry that she is broke again, what was her cut of 200 MILLION? question that was brought up... how did TLC get away with not having permits for 4 years. Regarding the 15%... What exactly do we KNOW about that figure? Why do people feel it is 15% of one total payment to the Gosselin family? Is that what it is? Or does EACH child get paid a certain salary percentage or amount of which 15% must go into a trust? From what I heard 15% of their pay (whatever it is) goes into a trust while the rest goes toward fees, manager/agent, expenses related to their "career" and taxes. Each child also gets the balance (if there is one) after all those deductions. Where THAT money goes I have no idea. Hopefully, that too goes into the trust or at least into a separate bank/savings account. Just read online that TLC quietly cancelled Kate + 8 b/c Jon refused to sign the contract. I missed a lot of the hearing. I only caught part of Paul Petersen and up through when the woman with the production company spoke. She made some good points but was definitely more concerned about the producers and all the trouble it would be for them to file for permits and trusts, etc than for the children. She also brought up that there should be a minimum pay amount like $800 but it made it seem like she wanted that per day (am I wrong?). I do think she brought up good points. I'm not sure that tv commercials should be viewed the same as tv/film "shows." The one guy also questioned the difference between a "series" reality show that focused on the same family/children such as Kate Plus 8, as opposed to a series that has a different family highlighted in each episode, such as Hoarders, and I would think that would include shows like SuperNanny and Wife Swap, etc. From preesi's scans -Thanks preesi! thought you would be interested. "Kate plus 8 gets cancelled!" Livvy said...I wonder if Kate would ever even consider that perhaps, just perhaps, that all these folks with so much more experience than she, could be right and she could be wrong??? Do narcissists ever admit they're at fault? I doubt if she's even going to acknowledge that there was a child labor hearing this morning and that the reality show her children *play* in was referred to more than once. She has her head firmly buried in the sand on this issue. 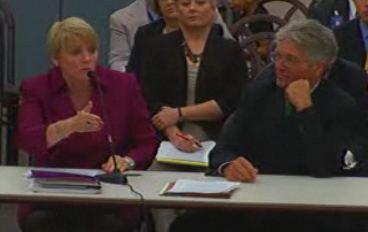 Provost, Arngrim and Pedersen gave compelling testimony and the committee seemed very attentive IMO. If new laws are passed as a result of this it'll be interesting to see whose talk show Kate is invited to cry on first and explain how SHE'S been wronged. Meredith is probably trying to call her on her pink phone right this moment. Sorry to post anonymous but when one gentlemen had quite a few questions on the money, trusts and taxes Allison said they each have a social security number they should each have a trust and be paying taxes. Is there somewhere where we can hear what happened this morning? Did someone copy the video stream? If so, please provide a link. HARRISBURG, Pa., Sept. 23 /PRNewswire-USNewswire/ -- A comprehensive overhaul of Pennsylvania's Child Labor Law is needed to ensure safer working conditions for young people, Labor & Industry Executive Deputy Secretary Robert V. O'Brien testified today before the House of Representatives' Labor Relations Committee. The House panel discussed two pieces of legislation: House Bill 19, sponsored by Rep. Jaret Gibbons; and House Bill 2515, sponsored by Rep. Thomas P. Murt. "The enforcement of child labor standards is an important department function," O'Brien said. "The current law – which dates back to 1915 – is antiquated, confusing and has not evolved along with Pennsylvania's occupational diversity. Updates are needed because the department's ability to regulate the employment of minors has been constrained by deficiencies with the current law. "The approval process for work permits and enforcement tools under the existing law are not only outdated, but inconsistent with the federal Fair Labor Standards Act. Stricter criminal penalties for violations of the Child Labor Law will help discourage potential violators of its requirements in all types of youth employment scenarios. The establishment of administrative prosecution capabilities will streamline the penalty process and aid the department in prosecuting violations in a more efficient manner." O'Brien also discussed the importance of making changes to the child labor law that protect all minors – not just those working in a single industry, as suggested by HB 2515. "We hope that discussions on updates to the current Child Labor Law will be crafted to protect minors working in all industries," O'Brien testified. "Strengthening the protections for all working minors – not just those in the entertainment industry – has been a shared goal of the department and the General Assembly through prior sessions. Focusing on a single sector unjustly neglects the need for a comprehensive overhaul." To review the entire testimony or learn more about Pennsylvania's Child Labor Law, visit www.dli.state.pa.us. I don't know if this is true or not but In Touch Weekly has an article out (Preesi's site has the scan of it) saying that K+8 is cancelled. Just thought it was interesting in light of the child labour hearings. Perez Hilton has an item on his website, "TLC cancels Kate Gosselin". Don't know if there is any truth to it but Perez Hilton claiming Kate plus 8 cancelled. Cannot confirn elsewhere. Slightly off topic, but I have always thought a lot of Alison. She's seems so down to earth. She regularly visits and appears on these tours in Hollywood that takes tourists around to where deceased celebs lived or died (okay so it' s a little macabre) but according to the owner of the company she really makes it fun for the tourists and is always very gracious with them signing autographs, answering questions, even doing commentaries on certain celebs etc...The owner absolutely loves her. So, I'm glad she was there today. She clearly is a good witness and spokesperson for this cause because of her nature and common sense (and her sense of fun too). y Dad died very suddenly one Sunday morning at Mass of a heart attack. I was 10, the eldest of 4. My Mom didn't work and didn't know how to drive. There was no life insurance, no income. A neighbor who was in soap operas at the time got my brother and into modeling. My brother worked a lot more than I did. He was cuter. LOL. It wasn't easy for my Mom to get us to our appointments. She had to pay baby sitters for the other two. We did that for about a year until one morning when my brother got up and asked my Mom if he had to go to work today. He was about 6. When he termed it as work, that was the end. All the modeling stopped. My Mom learned how to drive and got a job. It was tough on her. She was 35 with four kids and no income. She found a way. We all went to Catholic schools and we all had braces on our teeth. Once a year we went to the Jersey shore on vacation. That was our traditions and what a great tradition it was. All these years later, my children and their children go to the Jersey shore for their summer vacations. I guess my point is, my Mom stopped the modelling the moment we considered it working. My Mom is gone now but we all miss her every day and honor her for all the sacrifices she made for us. Love you Mom. I agree Julianna, it was excellent. Yeah for Rep. Murt and for Paul Petersen and all the now grown actors who have spoken up for children of reality programming. I am so glad to see these hearings taking place, and thank you to ALL the people stepping up to try and protect innocents who cannot protect themselves. Today's testimony confirmed everything we'd heard about the 15% figure (from last year's lawsuit and general info from industry contracts). The Gosselin 8 receive a 'combined' 15% of the gross contract amount for doing Kate+8 - not each, individual child receiving 15% - which would be almost impossible if you do the math (15x6=90%, leaving only 10% of the gross amount for Kate - impossible - but, perhaps justified). As Paul Petersen said, out of that 15% amount the parent may deduct almost anything and everything - expenses, education, fees, medical, etc. What he left unstated, but implied, was that there could be - and in many instances is - NOTHING left for the child when they reach the age of maturity. Someone briefly touched on the suggestion of making these trust accounts 'irrevocable' - imo a great idea, but one I doubt will be adopted. I hope someone took notes and will remind the Gosselin 8, in just 12 years they may want to sue TLC for just compensation and their fair share of the $200 million in profits from their show - and I hope they do! Thank you Rep. Murt, Paul Petersen, Allison, and James. You are all warriors of the innocents. This post will pop up late and I'm sure others have commented about it already, but anyway...I'm glad to see Jodi and Kevin attended. In spite of what Kate said about her brother and his wife it's obvious they truly care about all children in reality tv - not only their nieces and nephews. Poor ignorant Kate thinks it's all about the money. Too bad SHE didn't show up at something that was first and foremost 'all for the kids'. Livvy...thanks for sharing that special memory/story. I hope we'll all take a min. to just drop Rep. Murt an email, thanking him for his efforts on behalf of the G kids and all future kids in PA in the entertainment industry. It's been such a crazy several weeks I've wanted to chime in more but don't have enough time! But I'm so glad Alison Angrim pointed out the fact that adults are imposing their wants and desires on these poor kids. I love her quote about how an adult thinks it would be fun to be famous and therefore so would a child. I think one of the biggest flaws in sheeple logic is imposing THEIR feelings on a situation on children. I don't know if they have a general lack of understanding about child development, can't remember what it was like to be a child, and/or can't relate to children, but their views on how mansions, trips, money and STUFF makes for such a great life for these kids really speaks to exactly what Alison is trying to explain--imposing THEIR desires on little ones. If TLC did make $200 million profit from advertising, sales of video, syndication, etc they really don't owe J&K a dime because the idiots signed a contract. That contract did not include profits from advertising, sales of videos, etc. J&K were very stupid with the first contract that they signed and TLC doesn't owe them a thing. Except for equitable remedies in contract law, which covers a broad range of "unfair" contracts which includes that basically you can't take unfair advantage of unsophisticated people, strongarm people, mislead people, make people sign contracts that give you far too much and them too little, and so on. Just because you sign any old contract by no means promises a court of law will find that contract to be valid. It would have gone a long way in the PR dept. if Kate and Jon Gosselin would have attended the hearing. Kate especially continues to appear to be a "greedy grifter." She doesn't give a darn what we think of her as long as she makes money. Jon is on the fence with me and I hope he will someday be able to "tell it all." It would have gone a long way in the PR dept. if Kate and Jon Gosselin would have attended the hearing. Why would they have attended the hearing, the purpose of which was to discuss the need for a new bill protecting kids on reality television? Kate doesn't want protection -- she don't want laws interferring with the thing she has going. TLC hired a lobbyist. Should he have been there, too? It would have turned into a debate/argument, counter-argument, especially concerning whether reality shows are scripted. I can't imagine them sitting there quietly while the issue of the "fake" Christmas episode was brought up. With Kate wanting to continue filming, and Jon not wanting his kids on television, there would have been a battle within a battle. The kind of PR that would have ensued wouldn't have been the kind of PR that they or TLC would have wanted or needed!